Raj Palace is to be found on the Ranthambhore road in the district of Sawai Madhopur. The famous National Park is approximately 8kms from this resort. Raj Palace Resort, a budget property offers comfortable accommodation. At Raj Palace you will see royal tigers in the splendour of their natural habitat. Raj Palace Resort Ranthambhore, treats you with great royalty on your vacation to see the royal tigers in their natural dwelling. Here, your spirits will rise as your comforts will be looked with luxury and you too indulge in the wildness of nature. Raj Palace Resort, covered with lush greenery, perfectly manicured lawns and gardens will give you everlasting delight and you would simply love this place. The chirping of birds creates a music which is something out of this world. The hospitable staff will make you feel at home away from home. You will enjoy a royal treatment at Raj Palace and you will surely have an unforgettable experience which you are surely going to cherish all your life. 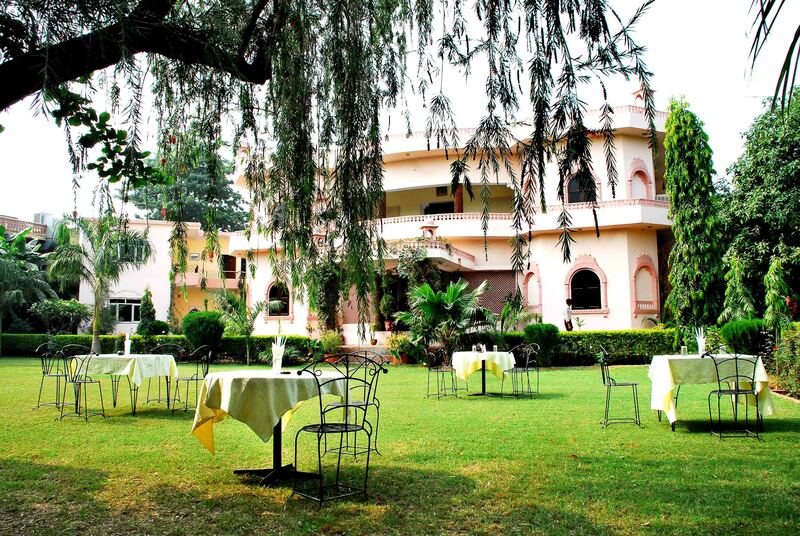 Raj Palace offers 35 air conditioned rooms categorised as Cottage and Deluxe rooms. Rooms and cottages offer cleanness with decoration which is sure to entice the moods of all the guests arriving here. You can have a breathtaking view of landscapes and scenery from the balcony of your room. All the rooms are big, spacious, airy and have rich modern furniture to suit everyone needs. Both the categories of room have a telecom and television as in-room facility. All the rooms have attached toilets which are kept impeccably clean and sanitized to avoid any kind of unhygienic thing. The resort has a pleasing lay out so you can have an amazing holiday here. The rooms at Raj Palace are well equipped with all the basic amenities and facilities. The multi cuisine restaurant at Raj Palace has a selection of Indian and Continental cuisine. It has a casual self-service restaurant with friendly staff. Room services are available for beverages and light snacks. The staffs are at service of guests around the clock. You can enjoy your evening here with drinks and listen soft music.